Drive! 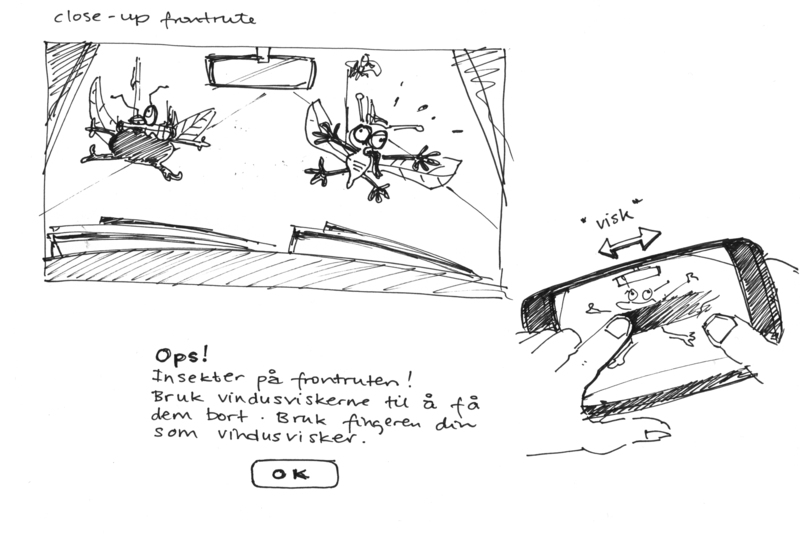 In-car driving game for Statoil Fuel & Retail. 1) Statoil used to have booklets with car games that they handed out at the gas stations, to children in the summer. They wanted to create a digital version of this in the form of an app for iPad and iPhone. The target group was children aged 5-15. 2) Get families to choose Statoil as their preferred gas station to stop at. We came up with a bunch of game ideas to include in the app. However, Statoil decided to go for only one main game, the Kjør! (Drive!) game. The player steers a virtual car based on the car he/she is sitting in – it has the same speed as the real car. On the road, you have to steer clear of dangers such as rocks and holes. You steer the car by tilting your device. The aim is to drive for as long as possible, collect coins on the way, and avoid dangers. Your car will eventually need more gas, and you use your silver coins to fill the tank. When you have gathered enough gold coins, you can exchange them for small drinks and ice cream the next time you’re at a Statoil station. You also get a free gas top up at the petrol station. If you run out of gas, it’s game over! This way, we successfully got the families to stop at Statoil stations. Signs on the virtual road indicates how far it actually is to the next Statoil station. In order to spice up the driving game, we added mini-games within the game. In version one, there is only one, which is the filling up the tank, where a gyro function is used. The player has to balance the gas nozzle over the gas hole of the car, and try to get as much gas in as possible in a time frame of 20 seconds. The other mini games, which never made it to the app because only one version was released, included wiping off bugs on the windshield, steering clear of a moose and repairing a flat tire. Early sketches at the bottom of the page. My role in this project: concept development, art direction, gamification development and testing.